Put your eBay customer service on autopilot. Stays in sync with your eBay account! 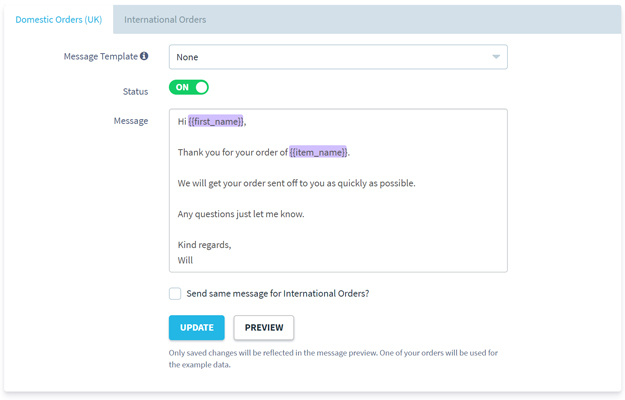 Improve customer experience by sending personalised messages at each stage of the order. Send different messages to your domestic and international customers. A simple blacklist feature allows you to easily add any username to whom you do not wish to send a message. 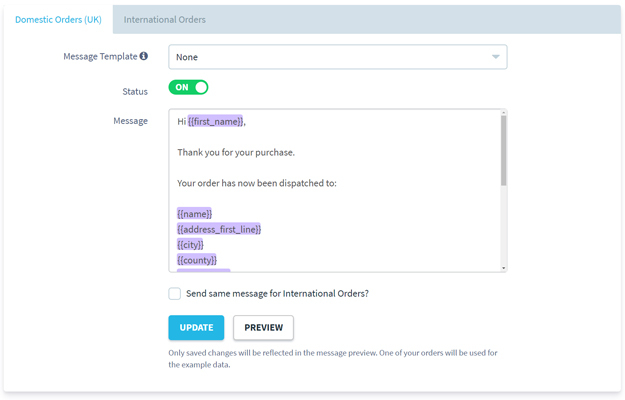 Send a message to your customers when their order is marked as dispatched. Send a feedback reminder message to customers who have not yet left you feedback. Send a message to your customers when they leave you positive feedback. Save precious time by leaving automatic feedback for customers after different order events e.g "Order complete", "Order marked as dispatched" and "Positive feedback received". 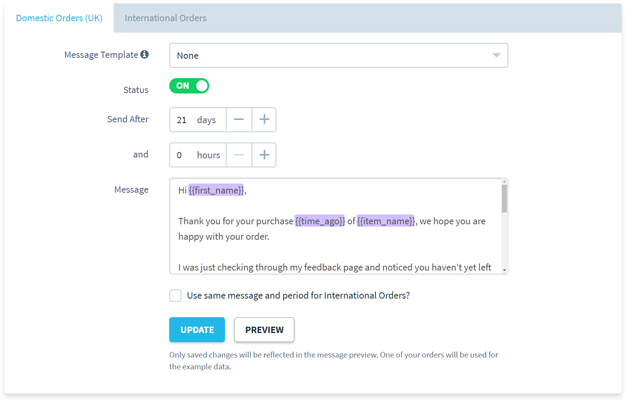 You can add the customer's first name or username to the feedback message to make your messages more personal. Graphs and reports for orders, customers, products and more. For any date range you choose. See your net sales figures (gross sales minus eBay and PayPal fees). See growth stats compared with previous periods e.g. 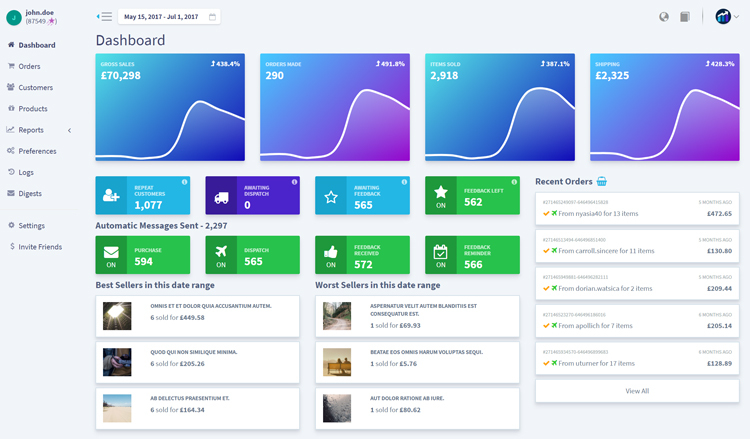 average order net, average order items, daily orders, daily gross sales. 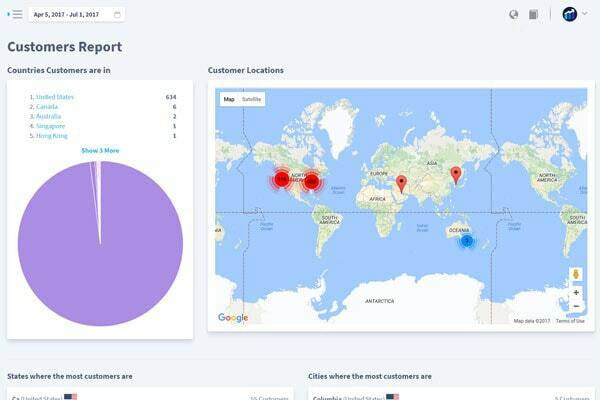 View profiles for all your customers, see individual customer metrics and compare them against your customer average. View all orders made by a particular customer, as well as customer contact details. You can also see all the items each customer owns. Add customers to your favourites so you can come back to them in the future. 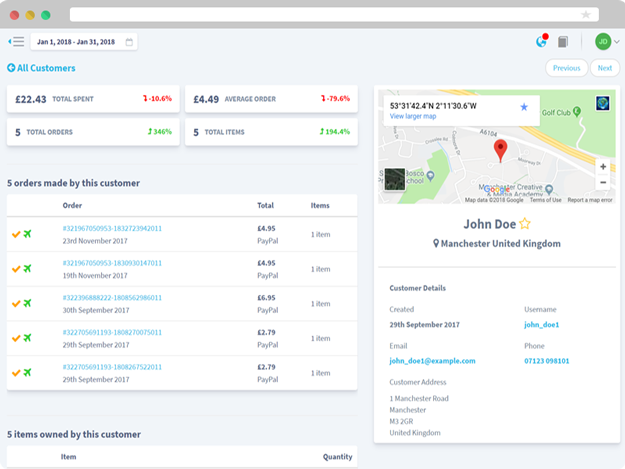 Whenever you receive an order for your eBay account it will appear in real time in your dashboard, as well as events such as "Order marked as dispatched" or "Positive feedback received". 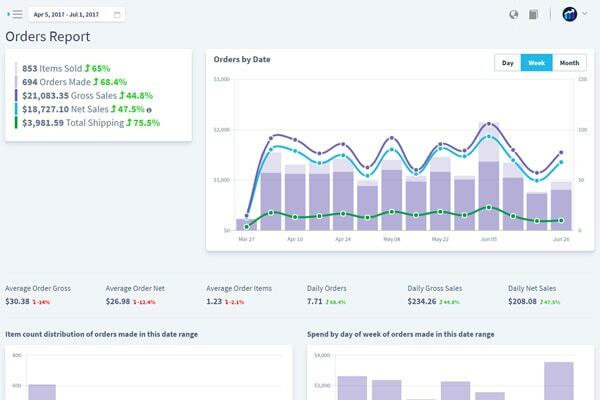 This allows you to view metrics and growth stats live. Quickly and easily set up daily, weekly or monthly email digests to keep you up to date with how your eBay account is performing. Digests contain a brief overview of sales performance over the day, week or month. They also compare this performance to the previous period so you can immediately identify upward or downward trends. 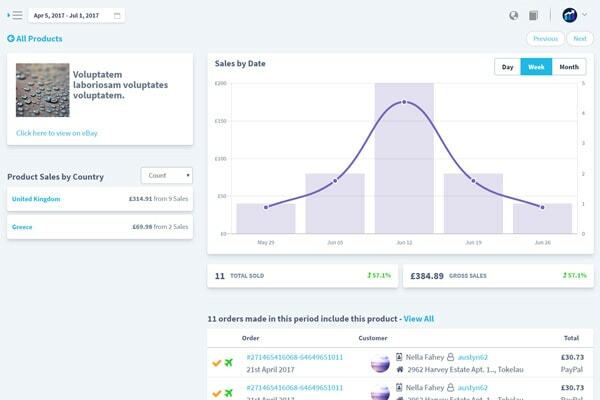 Your best selling products and orders are also displayed along with some useful order stats. 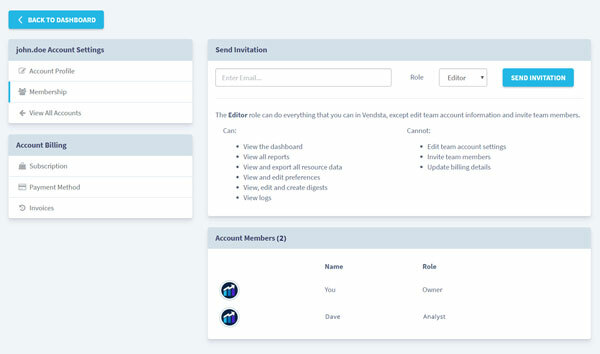 You can easily invite your entire team to view data or help manage your account. Vendsta provides a number of different team member roles with different permissions. This means your team only sees what you want them to. For example, the "packer" role can only view orders and customers, they cannot export any of the available data. 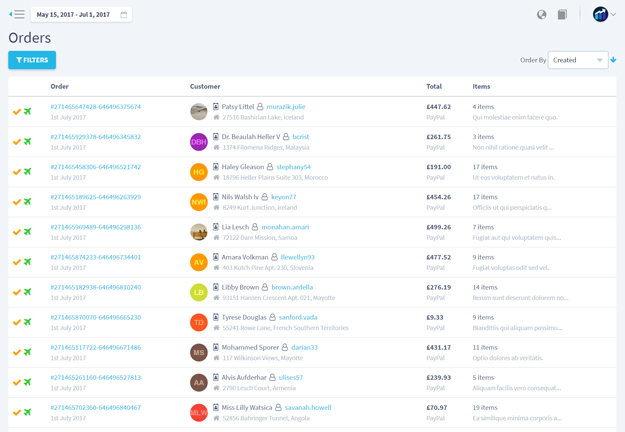 Filter orders, customers and products to return only exactly what you are looking for. Search orders by name, username or order ID. See more reviews on the eBay solutions directory. Allows me to send tailored feedback and also allows me to request reviews easily. This is a great automation tool and excellent value for money. We're now not only on top of feedback we're also doing a much better job and freeing up precious time for other tasks. Highly recommended. Just wanted to say I came here from Reddit and its like you read my mind for what data I wanted to see. Incredibly good dashboard and overview, intuitive and very easy to use. The feedback reminder is simple but effective, we've noticed a definite increase in customer feedback left since using it. We know you'll love using Vendsta, that's why we're giving you a full 30 days to try it out for free with no limitations! You don't even need to provide any card details!